A patient with a basilar artery stent develops a subdural hematoma and is taken off Plavix. 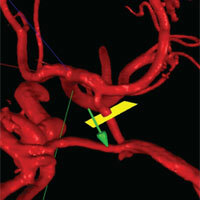 NOVA allows close monitoring of the basilar artery flow status during this critical phase of the patients treatment. 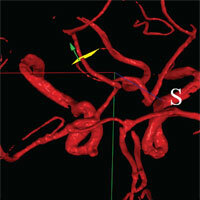 Grade 1 dural arteriovenous fistula associated with severe right transverse sinus stenosis. 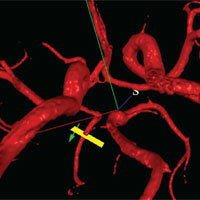 NOVA quantifies the improvement in cerebral venous blood flow after angioplasty and stenting. A flow diverting stent did not open fully on deployment. NOVA QMRA documents preservation of flow after stenting and provides a baseline for non-invasive follow up. The patient presented with a new stroke 10 months post coiling. A 65 year old, right handed woman had an episode of unusual gait and fell to her knees. Her symptoms resolved within 5 minutes. She was seen in the ER and diagnosed with a TIA. 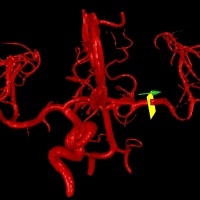 NOVA quantified the amount of blood flow the patient would lose if the carotid were to occlude. A 28 year old woman with a left parietooccipital AVM was found unresponsive. 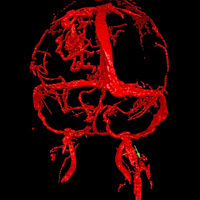 NOVA provides quantitative measurement of the blood flow leading to and from the AVM, helping her physicians to determine the effectiveness of treatment. 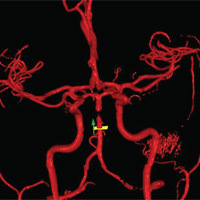 A 55 year old male referred by his primary care physician for a left internal carotid artery occlusion with recurring symptoms. 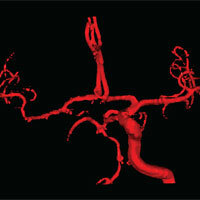 NOVA was performed with and without diamox to evaluate cerebrovascular reserve. 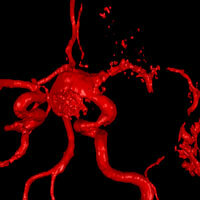 A 79 year old woman develops stroke symptoms on post-operative Day 1. NOVA rules out a hemodynamic cause and supports the decision to administer heparin to treat embolic stroke. 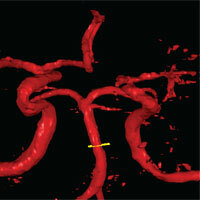 A 58 year old man presents with asymptomatic carotid restenosis two years post CEA. 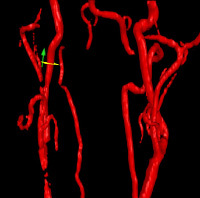 Quantifies and documents the improvement in carotid artery blood flow after angioplasty and stenting. A 68 year old man with bilateral carotid stenosis is being considered for carotid endarterectomy. He is reported to have a > 90% LICA stenosis on ultrasound. Quantitative vessel flow measurements refute the ultrasound findings and confirm normal cerebral blood flow. An incidental finding is vertebral steal. 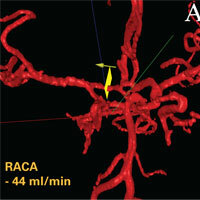 A 41 year old woman presents with an intracranial bleed and is found to have a dissection of the basilar artery. NOVA shows that blood flow in the posterior circulation is adequate and supports a decision to defer a high-risk intervention. 46 year-old Indian woman with amaurosis fugax on the left. 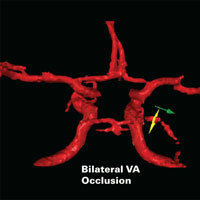 In the presense of a LICA occlusion, NOVA and vascular reserve testing both show good collateral compensation. 71 year-old woman with a 2 episodes of right hand jerking thought to be possible limb-shaking transient ischemic attacks; left carotid endarterectomy on asymptomatic basis 3 years prior. Based on the NOVA result and vascular reserve testing, her perfusion was likely adequately compensated and no intervention was offered. She is medically treated and has not had any recurrent ischemic symptoms in more than 2 years. A 40 year-old Caucasian man with acute onset of dysarthria, left sensorimotor loss and imbalance. NOVA demonstrated that large vessel posterior circulation flows are not likely to be associated with the patient’s symptoms. 65-year-old man; Status post-stroke involving posterior circulation territory;High grade left vertebral stenosis just proximal to the vertebrobasilar junction. 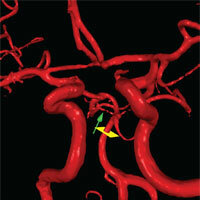 NOVA provides early, non-invasive indication of restenosis. 35 year-old right-handed woman presented with a one-week history of left leg weakness and difficulty walking. 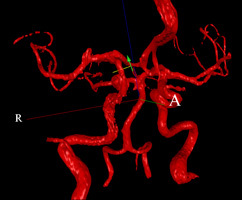 NOVA QMRA demonstrated that the intracranial circulation (anterior) was preserved despite the presence of bilateral ICA occlusions. 69 year old female with carotid artery stenosis and an ophthalmic artey aneurysm. A comparison of two NOVA studies done at 3 months interval shows the overall cerebral blood flow during normal sinus rhythm and the reduction of flow during an episode of atrial fibrillation. 58-year-old male presents with right-sided TIA. 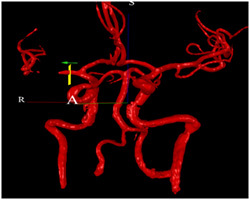 The MCA waveform morphology and right/left sided asymmetry in MCA flow signified an impending stroke. 57 year-old right-handed gentlement. Presented with transient right hemispheric symptoms which included left hemianesthesia and dysarthria. 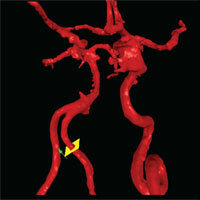 NOVA guided the interventional treatment strategy and confirmed restoration of right hemispheric blood flow. 56 year old male; VBI, symptoms resolved. 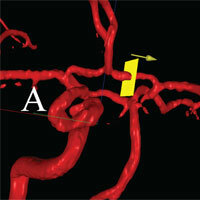 The angiogram shows long segmen BA stenosis & RICA occlusion. 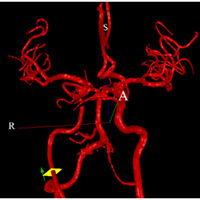 NOVA provides quantitative measurement of Pcom collateral and shows that flow in the posterior cerebal arteries is maintained within the normal range. 61 year old male with two episodes of vertebral basilar insufficiency; one transient locked-in event precipitated by aggressive treatment hypertension. 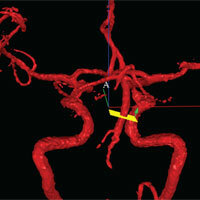 NOVA guides a less invasive treatment strategy utilizing carotid endarterectomy.